The city of Rellekka is the popular home to the Fremennik. It lies in the Fremennik Province, which is located north of Seers' Village. In Rellekka, you will find many attractions. There are fishing docks, mining sites, clothing stores, and much more. Wandering travelers who stumble upon Rellekka will notice there is not much to do here if they have not completed the quest, The Fremennik Trials. The most basic and simplest method of transportation to Rellekka is walking. From Seers' Village, follow the trail east of the bank in a northward direction. Eventually, curve and walk west. Take another curve and walk north from now on. You will arrive in Rellekka shortly. 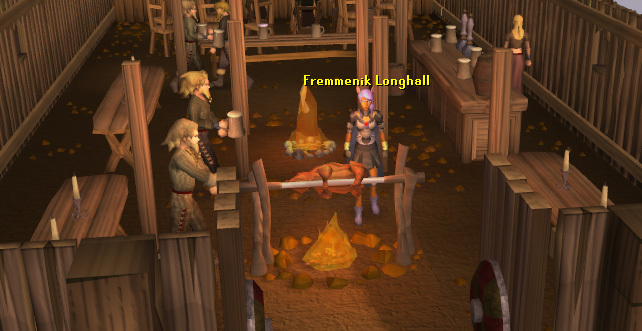 In order to use this method, completion of the quest, The Fremennik Trials, is needed. During the quest, you are required to create an Enchanted Lyre. When enchanted by the Fossegrimen and activated by a player, it allows the player to teleport to the entrance to Rellekka. The Enchanted Lyre is an instrument, and is activated by playing it. The Fossegrimen's shrine can be found south of Rellekka. 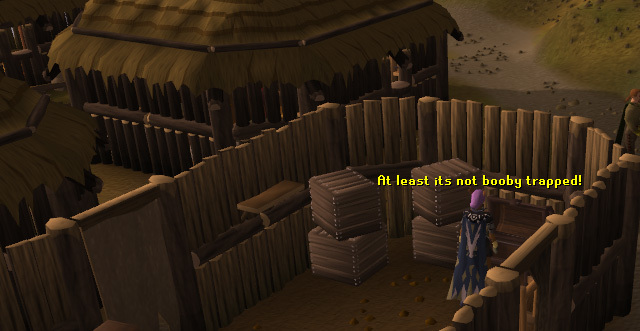 This method requires a player to have a house built in Rellekka, requiring level 30 Construction. Simply use "House Teleport" to appear in your own home. Exit your house through the main portal and walk north to Rellekka. This method is only available to players who have started the quest, A Fairy Tale Part II: Cure a Queen, and have earned the rights to use Fairy Rings. A fairy ring can be found close Rellekka. 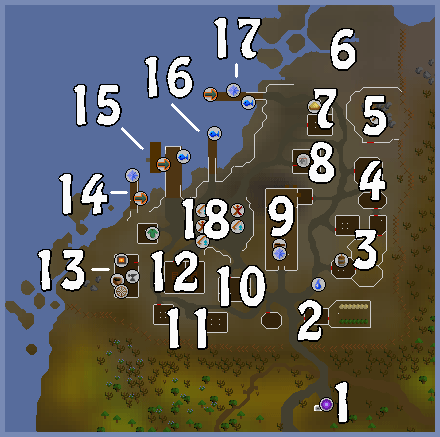 Use the coordinate AJR from the main ring in Zanaris to be teleported outside the Fremennik Slayer Caves. Walk west until you come upon a trail that leads north. Follow this trail to quickly arrive in Rellekka. This method is only accessible to players who have completed the quest, Lunar Diplomacy, and have level 72 Magic. While on Lunar Magicks, use the spell "Waterbirth Island" to arrive on Waterbirth Island. Find Jarvald and ask him for a boat ride to Rellekka. Right outside the Rellekka entrance is the Player-Owned House Portal. Players who have level 30 Construction and have paid the Estate Agent 10,000 coins will be able to find their houses via this portal. As you enter Rellekka, you will be welcomed by the view of a wooden town. The majority of the houses are built with wood and hay. One of the first NPCs you will feet upon your entrance is Sigli the Huntsman. He plays a part in the process of making you a true Fremennik. You will also notice two town guards and a level 48 Warrior. The warrior can be attacked and the guards can be attacked. West of Sigli is a house with an NPC named Pontak. 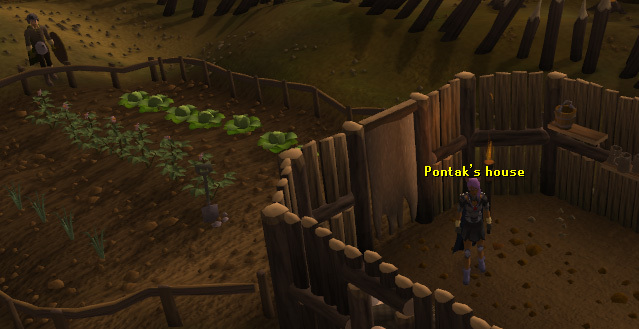 Pontak is level 48, but cannot be attacked. However, you can pickpocket him for generous thieving experience. In the backyard of Pontak's house, you can find three rows of vegetables: onions, potatoes, and cabbages. Point three covers three houses in Rellekka that are fairly close together. Directly north of the vegetable garden is Lanzig's house. Lanzig is a level 48 NPC who you can attack and pickpocket. East of his house, considered his backyard, there are some level 1 chickens and level 3 roosters. To the west of Lanzig's house is Ingrid, who features in Olaf's Quest. Moving north again, you shall come upon a house owned by Freidir and Inga. Both of them are level 48. You can attack and pickpocket Freidir, but you may only pickpocket Inga. Lastly, move east to an empty house. Exit the house through the south to appear in the empty house's backyard. There are no attackable creatures here, however you will notice a dairy cow. The dairy cow can be milked and you can steal its cowbells, which are needed in the quest Cold War. This point on the map covers two houses. The southern house contains a chest, many crates, and a helpful bucket of milk respawn. The northern house contains an NPC named Borrokar. He is level 48 and players can attack and pickpocket him. Outside both houses, toward the west, is Olaf the Bard. He is an important NPC during the quest, The Fremennik Trials. North of the double houses is a fenced mining site. Take your pick (haha!) from coal, silver or clay! There is no bank in Rellekka, unfortunately, which means mining in this vicinity is not a useful choice. However, players who do not mind power mining for experience could benefit from this quiet mine site. North of the mine site is a popular training area in the members' world. 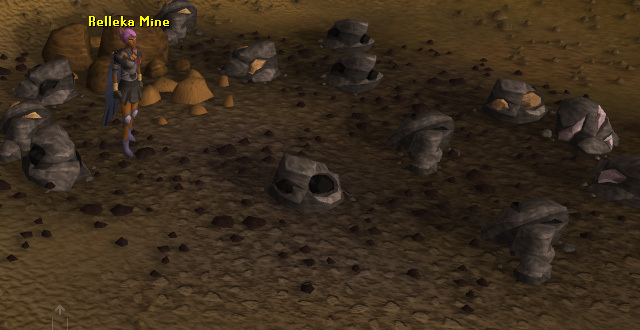 Here you can find many level 13 Rock Crabs and a few level 42 Hobgoblins, at the north western part of the area. 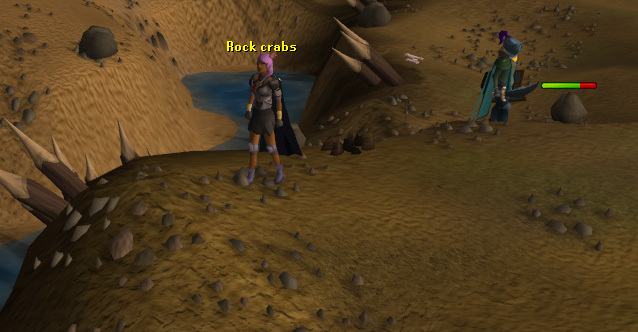 Rock Crabs are an acceptable choice for training because of their weak Strength and high number of Life Points (500). Surrounding the Rock Crab area are some loan islands. Some contain unreachable Hobgoblins, while other contain items. The two northern most islands contain a sapphire respawn and double nature rune respawn. To obtain those items, use the magic spell "Telekinetic Grab". South of the Rock Crab area is a house with a sand pit on its northern side. 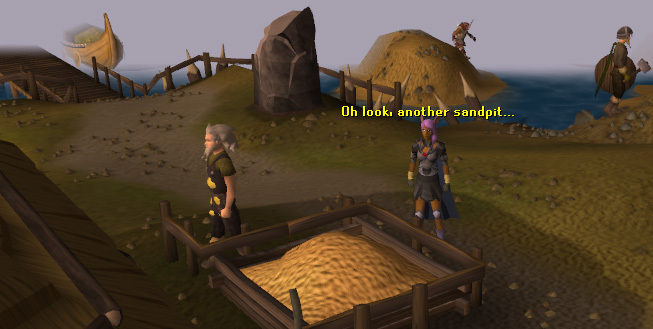 Players are free to use this pit to collect sand for their crafting and additional needs, by using a bucket with it. Inside the house, you can find two NPCs named Reeso and Freygerd. Reeso is a simple NPC who you can only talk to, while Freygerd is a target for attacking and pickpocketing. South of the house containing the sandpit is a Battle Gear store. Two NPCs can be found inside the house: Thorvald the Warrior and Skulgrimen. Skulgrimen is the owner of the store. 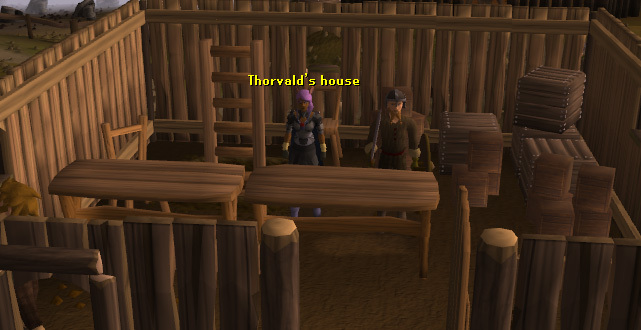 Thorvald is an important NPC in the quest, The Fremennik Trials. He teaches you to fight Koschei the Deathless, who is located down the ladder in the northeast corner of the building. Once you defeat Koschei, you cannot climb down the ladder again. 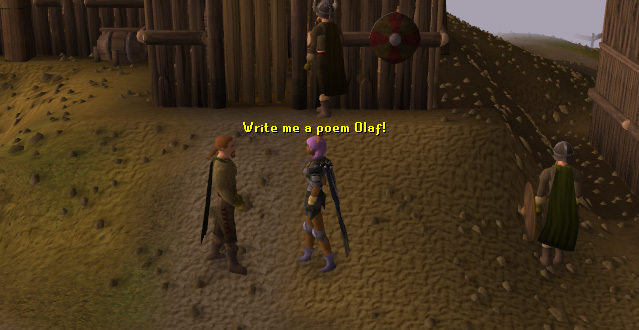 To the west of the two is Volf Olafson, who features in the beginning of Olaf's Quest. Continue moving south of the battle store to come upon the Fremennik Longhall. This is the building where you will find many high-authority members of the Fremenniks. One of the first men you shall come upon is Brundt the Chieftain. As his name suggests, he is the head chief of the Fremenniks. Also, Brundt plays different roles in the following quests: The Fremennik Trials, Mountain Daughter, and Lunar Diplomacy. 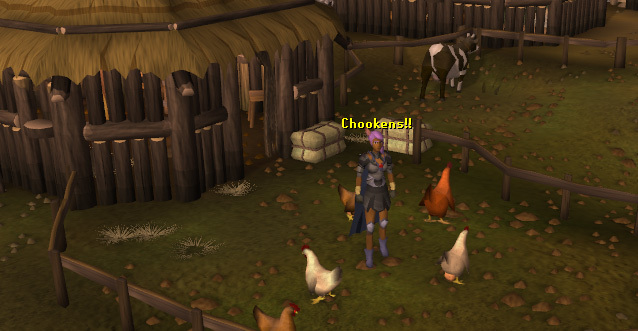 If you dislike your Fremennik name, you can charm the Chieftain into getting a new one with a Ring of Charos (a), obtained from the Garden of Tranquillity quest. Other NPCs in the bar include Thora, Manni, Bjorn, and Eldgrim. Thora is the barkeeper of the hall, and will sell you different types of beer. Manni is an NPC from The Fremennik Trials who you must challenge to a bear-drinking contest. The two remaining NPCs, Bjorn and Eldgrim, are unimportant and can be found wandering around the hall drinking beers. Askeladden, the young boy just outside the longhall, plays a role in The Fremennik Trials and gives Pet Rocks. As we continue our tour around Rellekka, we come to a house located north west of the entrance to the town. 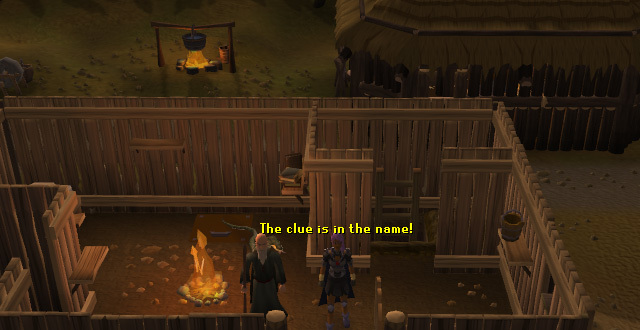 Swensen the Navigator resides here, and if you are doing The Fremennik Trials, you will need to take his puzzle. If you've not already noticed, his name only includes the compass points, north, east south and west. The house also includes a chest which can only be raided with a lockpick. There are a few crates and boxes here, too. The ladder to the south of the house leads to Swensen's maze, used in The Fremennik Trials. In the most western house of these two is a NPC called Jannella who you can attack and pickpocket. In the middle of a room is a fire that you can cook on. Moving now to the most eastern house. 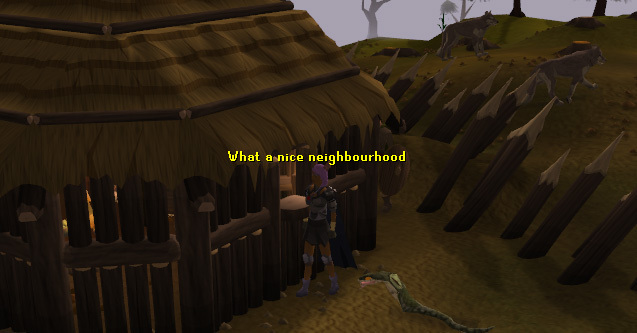 An NPC called Sassilik lives here and can be pick pocketed. To the north east is a chest, which you will need to search for traps, and inside there is a whole 10 GP treasure. As with the other house there is a fire in the middle of the house. This room is used in the Fremennik Trials quest, and can be entered via Peer the Seer. Unfortunately for people who have finished the quest, you don't really feel like going in again. Another cool thing about this location; if you have done the quest, talk to Peer the Seer outside, and he will predict weird and wonderful things about your day! 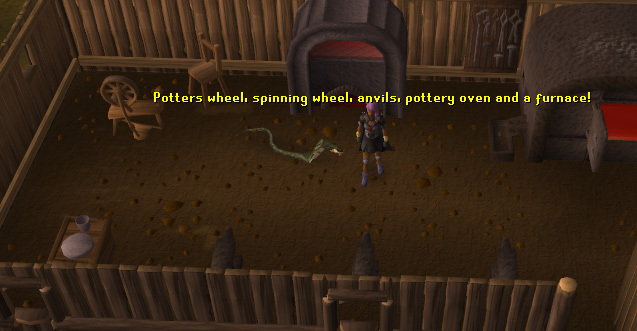 In this very helpful room slightly west of the Market, where there are some Anvils, a Furnace, a Pottery Oven, a Spinning Wheel and a Potter's Wheel! These are both helpful to the Smithing and Crafting skills, especially the Furnace and Anvil, that are right next to each other. There are no NPCs here, except for the odd level 48 Warrior that will walk in and out sometimes. North west of the market is a dock, with a quest symbol ( ) marked on it. Once there you will find two people, one called Jarvald and the other Lokar Searunner. Jarvald will whisk you off to Waterbirth Island, and Lokar will take you to Pirate's Cove. He is used in the Lunar Diplomacy quest. Directly north of the Market is a dock containing a fishing spot and a Sailor and his boat. 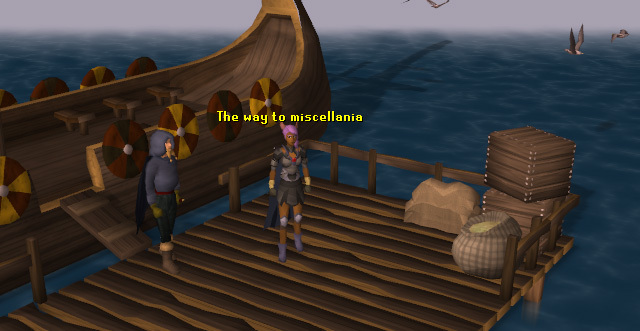 The Sailor plays a part in the Throne of Miscellania quest, as he will take you to Miscellania. In this area are three fishing areas, which you can bait or net. This is the second fishing spot, also located north of the Market. 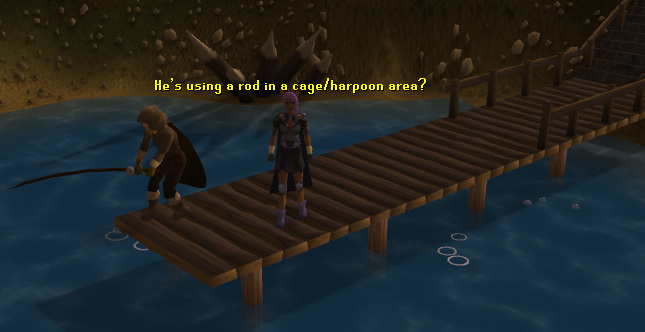 In this area you can cage and harpoon fish, using the Fishing skill. 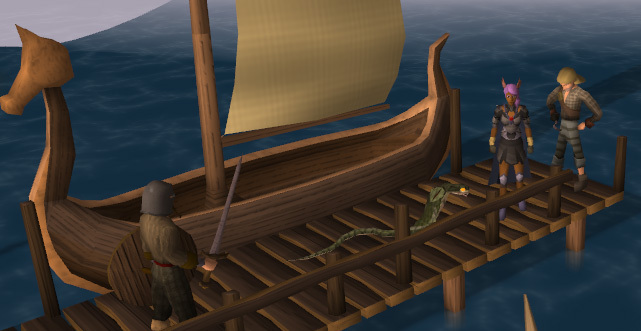 There is one NPC located to the north of the dock, funnily, he is called Fisherman. At spot 17 is Mord and Maria Gunnars, who both feature in the Fremennik Isles quest. 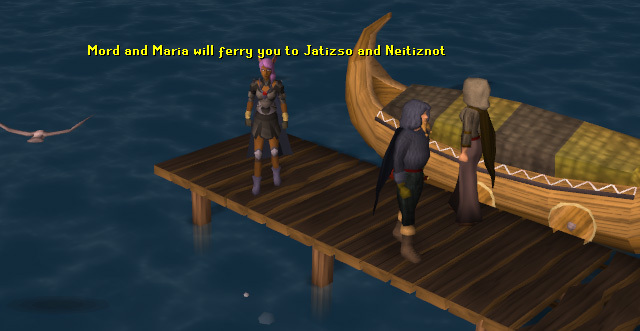 The man you start the quest with, Mord, will take you to Jatizso, and Maria will take you to Neitiznot. There are also 4 net and harpoon fishing spots here. This, with the Rock Crabs, is one of the main features of Rellekka. You can thieve, attack and trade here, with a selection of stalls and people to take your fancy. Starting on the north east of the Market and working south you will find a Fur Stall, a Fish Stall and a plain Market Stall. Starting on the southern most point of the west side and working north you will find another Fish Stall, another Fur Stall and one more Fish Stall. These can all be thieved from. 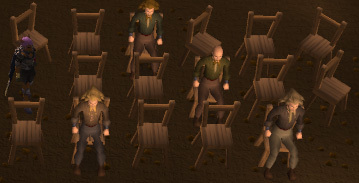 NPCs in the Market include the Fish Monger, the Fur Trader, Sigmund the Merchant, a few level 48 Market Guards that will attack you if you are caught thieving, Warriors and finally a person called Agnar who you can pickpocket! Sigmund the Merchant sells many items ranging from groceries like cabbage to adventuring items like rope and tinderboxes. He is found wandering the centre of the market. The fish mongers stock consists of raw fish, bait, and more! The Fish Monger is found wandering the Rellekka Market. The Fur Trader sells two types of fur. Just west of the market is Yrsa, who owns the Clothing shop. Her shop sells lots of Fremennik clothing and colourful capes. You will find these people and NPCs around Rellekka. These are the monsters and people you can attack in Rellekka.